"I stumbled here quite by accident but a fortuitous one it seems since I know both Ken and Gary. Though as Ji says just because it happens to be made the same way doesn't necessarily prove anything but there are plenty of medieval Arab recipes that have you drizzle dough into hot fat. A pierced coconut is the favored utensil. The origin is likely Persian because of the name "zulabiya." Indian jalebi probably has the same origin. There's lots of Italian versions of this too. And for what it's worth the Acadamie Française dictionary traces pets de nonnes to the fourteenth century "pets d'Espagne." I'd put my money on the Arabic origin." In response to this I originally replied that "...while I wouldn't discount the possibility of Moorish origins, but there is no proof. As I mentioned and as you expanded upon, there are Arabic batter fritters that are drizzled through holes into hot oil. These only superficially resemble churro et al, specifically they are not made from a hot water dough, which is important. Hot water dough doesn't drizzle well. Pushing a dough through a syringe is a different process to drizzling it though a sieve or pierced coconut..." I believe that this remains important point, churro and European syringed fritters are made using a very specific dough type that differentiates them from the very many other types of fritter, historical and extant. When I originally wrote the article the earliest source I had found was 16th century Europe. During the period of the 16th to 17th century these fritters appear in many European countries, the early modern period was a fritter crazy time. On the other hand I could never find an Arabic version of this hot-water dough fritter. However, I have recently read Nawal Nasrallah's translation of Ibn Sayyar al-Warraq's Tenth-century Baghdadi Cookbook, published as "Annals of the Caliphs' Kitchens". In this text while there are recipes for Zalabiya Mushabbaka (Latticed Fritters) that Michael mentions above, there is also one recipe for "Zalabiya Ghayr Mushabbaka" (un-latticed fritters). This recipe is for a hot-water dough fritter, albeit an unusual version. In this recipe the instruction is to cook flour in oil (make a Roux) and then add milk until it thickens. It you have made Béchamel sauce before then you will recognise this process. When the dough has cooled you form them into rings and fry them. Pets de nonnes with a hole. So there is at least one early Arabic version of this fritter. However this still doesn't mean that this is the origin of Churros. This tenth century recipe doesn't appear in other medieval Arabic sources that I have access to (not an exhaustive list I must say), including the 13th century Anonymous Andalusian recipe collection . In short there is no continuity from this 10th century Arabic source to the hot-water dough fritters of the early European texts. There is also another issue in that the Roman recipe collection generally known as "Apicius" was a popular text in Medieval and Early Modern Europe also gives directions for making a hot-water dough fritter. In this instance flour/semolina is put into hot water until thickened (pultem), the cooled dough is then cut into suitable shapes and fried in oil. Although the text of Apicius is from before the 10th century and thus has precedence to the Arabic source, it was also copies were made and traveled throughout Europe from the Medieval period onwards. In this respect the Apicius is the earliest European source, potentially, if highly speculative, even the source for later European recipes. At this point I believe that while there is now evidence for very early production of hot-water fritters, there is still not enough evidence to connect these isolated recipes to the early modern hot-water fritters or the later developed Churro. It will be interesting to see how this research develops. p.s. A further update, I recently came across the Turkish fried hotwater dough fritter "tulumba tatisi" ("pump sweet"), these are piped put of star nozzle, just like churro, and just like syringe fritters are named after the devise used to do this. In some instances "Tulumba" can also mean "syringe". Found throughout the Balkans. Although not Moorish this does shift the very specific cooking technique to the Eastern Med. and the Islamic sphere of influence. It will be very interesting to find out their origin in this part of the world. On a hot summer evening in 1661 London diarist Samuel Pepys giving up all hope of a comfortable nights sleep, decided that there was really only one thing to be done – he went into his garden and drank huge amounts of wine and ate bread and butter with botargo until “very near fuddled”. Having sat though at least one similarly hot Melbourne night in a bath tub full of cold water with a book and a glass of wine to pass the time, I know exactly where he was coming from. I have never heard of, let alone eaten, the mysterious “botargo” he mentions, but maybe it was worth tracking down for next time there is a power outage during the summer? I little bit of research turned up the surprising fact that botargo was “the salted and dried roe of grey mullet and occasionally tuna”, not something I was likely to come across then. Eventually, I did come across a small exquisitely labeled and accordingly priced jar of a fine orange-brown dust which claimed to be “Botargo” in an exotic location (a Scottish-Italian Deli in truth). How could one resist charms of an exquisitely labeled jar of exotic powder? Certainly on this occasion not me and later that night I had my first taste of botargo. Five minutes later, and several mouthfuls exotic dust sprinkled pasta later, I still really couldn’t understand why anybody would want to eat what was effectively very expensive salty, fishy nastiness. Just to make sure I wasn’t mistaken the first time, I did try to eat it on several other occasions, and at least once I served it to some long suffering friends (who thereafter referred to the event as “The evening of evil fishy nastiness”). Botargo it seemed was just another one of those food ingredients that looked and sounded exotic enough that I felt that I had to try it, but were just plain nasty. Obviously, Pepys and everybody else in the last four hundred years that said they liked it were obviously mad, lying or both. Strangely enough though, I recently had a botargo epiphany and have come to the conclusion that not all salted and dried fish roes are created equal. 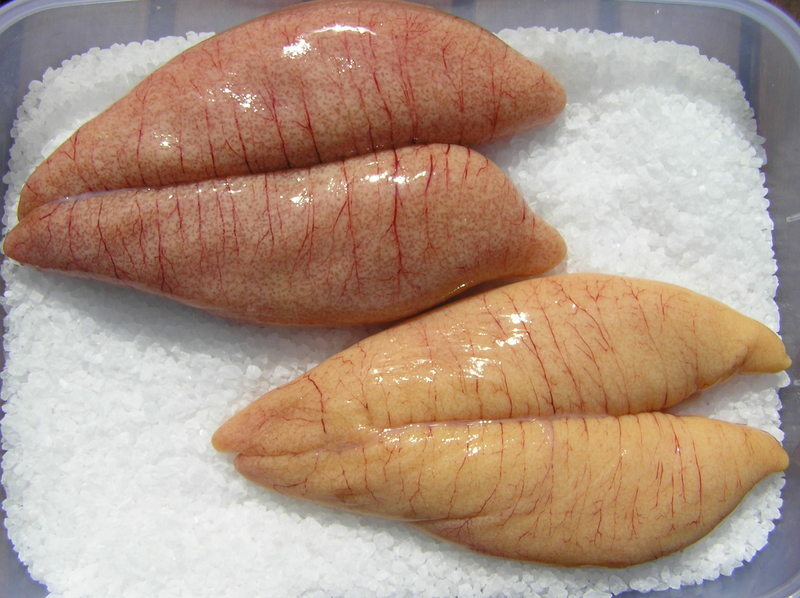 Which was rather a surprise, after all botargo is just salted and dried grey mullet roe, a very simple product, so how could one version be delicious and another just plain nasty? Could it simply be another example of the universal law that everything tastes better on holiday? This was very possible; after all I ate these utterly delicious sparkling shards of botargo in a Spanish bar, drinking salty manzanilla sherry and watching the setting sun turn the Guadalquivir river into a sheet of molten gold. From previous bitter experience I had learnt that I am a sucker for the whole “setting sun, rivers of molten gold” thing and that under these specific circumstances I am inclined to buy large amounts of retsina wine or obscure herbal-anise liquor combinations, only to regret doing to so when opening these holiday “treasures” back home in non-holiday reality. So obviously there was only one thing to do, I filled up my suitcase with vacuum sealed packets of botargo and took them back to Edinburgh where I was living at the time. During this trip to Scotland’s capital I experienced some of the most low, grey and moisture laden sky known to man, a perfect environment to test the deliciousness (or not) of holiday botargo. 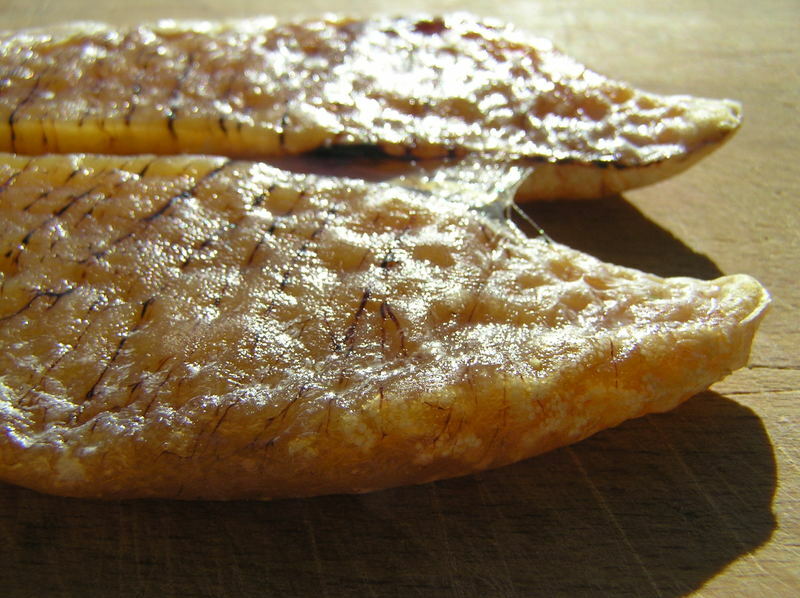 BOTARGO: A kind of salt cake, or rather sausage, made of the hard row of the sea mullet, eaten with oil and vinegar, but chiefly used to promote drinking. An act for making Billinsgate a free market for sale of fish" 1699.
such fish so imported and sold, contrary to the true intent and meaning hereof…. First then (because beefe being the greatest rarity in the island) I will begin with it, and of that sort there are three dishes at either messe, a rompe boyl'd, a chine roasted, a large piece of the breast roasted, the cheeks bak'd, of which is a dish to either messe, the tongue and part of the tripes minc't for pyes, season'd with sweet herbs finely minc't, suet, spice, and currans; the legges, pallets, and other ingredients for an olio podrido to either messe, a dish of marrow-bones; so here are fourteen dishes at the table and all of beefe : and this he intends as the great regalio to which he invites his fellow-planters ; who having well eaten of it, the dishes are taken away, and another course brought in, which is a potato pudding, a dish of Scots collops of a leg of porke, as good as any in the world, a fricacy of the same, a dish of boyl'd chickens, a shoulder of a young goat drest with his blood and tyme, a kid with a pudding in his belly, a sucking-pig, which is there the fattest, whitest, and sweetest in the world, with the pognant sauce of the brains, salt, sage, and nutmeg, done with claret wine; a shoulder of mutton, which is there a rare dish ; a pasty of the side of a young goat, and a side of a fat young shot upon it, well seasoned with pepper and salt, and with some nutmeg; a loyne of veal, to which there wants no'sauce, being so well furnisht with oranges, lymons, and lymes; three young turkies in a dish; two capons, of which sort I have seen some extreame large and very fat; two henns with eggs in a dish ; four ducklings ; eight turtle-doves, and three rabbits; and for cold bak't meats, two Muscovie ducks larded, and season'd well with pepper and salt: and these being taken off the table, 'another course is set on, and that is of Westphalia or Spanish bacon, dried neats" tongues, botargo, pickled oysters, caviare, anchovies, olives, and (intermixt with these) custards, creams, some alone, some with preserves of plantains, bananas, guavers put in, and those preserved alone by themselves ; cheesecakes, puffs, which are to be made with English flower and bread; sometimes tansies. It is perhaps from this account by Richard Lingon that Samuel Johnson made the observation in his dictionary that "Portago" is described as a "West Indian Pickle". shops perfume ye streetes with no agreeable smell. But in general, where there was 17th century boozing, there was Botargo and this remains true even today. Its salty-sweetness flavor is perfect for the taste profile of sake and fino sherry. It is also a friend to crisp, lager style beers. Happily its subtle fishy-sweetness means that it does work very well in a range of other dishes, small amounts enhancing the flavor of more bland base ingredients. Unfortunately, it remains an expensive product and I have rarely, if ever, seen it offered for sale in Australia. This means that the easiest and cheapest solution is to make the botargo yourself. Unlike many luxury products this is actually very easy to do at home with minimum fuss and bother. A fresh mullet roe will cost less then two dollars and will produce enough botargo to dress enough pasta for ten people. Fresh roes are available from many fishmongers, especially those to cater to a Greek client base. The only other cost is enough sea-salt to cover (approximately 500 gm per roe), what other luxury food item can be produced for so little cost and effort? Botargo itself is quite versatile, depending on how much is used it can be a dominant or background element in a dish. When briefly cooked (as in the pasta recipe given below) the fish aroma which some people find objectionable is neutralized and the botargo gives a savory earthiness to a dish, in much the same manner which occurs when cooking with Thai fish sauce or dried shrimp paste. - place half of the salt in a shallow plastic container. Rinse and pat dry the roe, place on salt and cover with the remainder of the salt. - place in refrigerator and leave for at least 6 hours to over-night. - carefully remove the roe from the salt and rinse of salt, pat completely dry. Wrap loosely in kitchen paper and place out-side in full sun or place on a drying rack back in the refrigerator. - at night bring the roe inside and place on a plate under a weighted board (a can of soup is about right) in the refrigerator. Change the kitchen paper if it becomes moist. - repeat this process for six-eight days until the roe has hardened and has developed a golden-orange colour. - the botargo can be stored in a sealed plastic container or bag in the refrigerator for up to a month or for up to a year at least in the freezer. 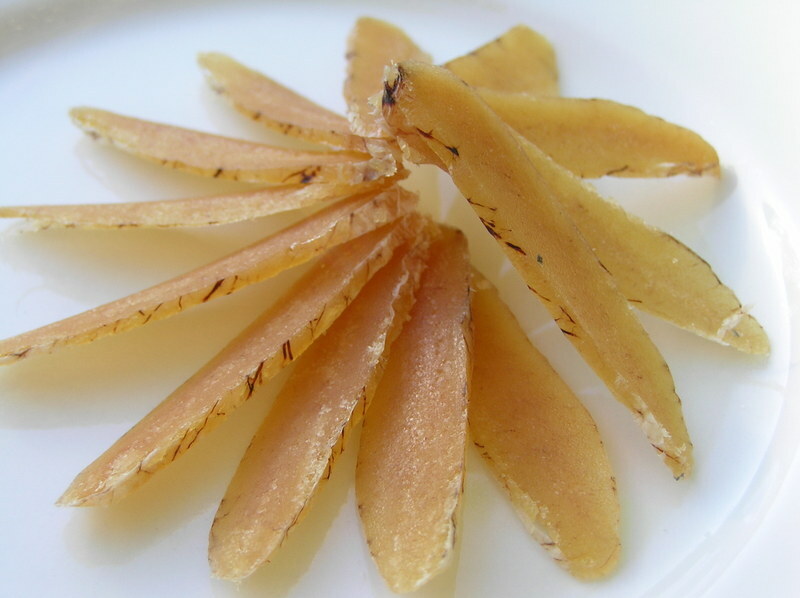 Thin slices of botargo can simply be served on its own with a few drops of extra virgin olive oil and lemon juice, or as Pepys did on a hot summer evening, simply with bread and butter. - cook pasta in plenty of lightly salted water until al dente. - While the pasta is cooking, gently heat the olive oil in a deep pot with the crushed garlic. When the garlic starts to gently bubble and give its flavor to the oil, add the botargo and cook for no more the thirty seconds or so to avoid burning the botargo. - At this point drain the pasta and add to the oil. Mix well and serve. 100 ml extra virgin olive oil for the beans, extra to brush crostini. - soak beans over-night and drain. Place beans in a heavy casserole and cover with water bring to boil. Drain beans and discard water. This step removes some of the bean carbohydrates that contribute to gas production and removes much of the scum that is produced when beans are initially boiled. - place beans back in casserole and cover with water to depth of 3-4 cms. Add garlic and herbs and olive oil. Heat to boiling point, then turn down the heat to the lowest setting. Cook beans until tender and they have absorbed oil and liquid. Beans are cooked when soft, but not broken or pulpy. A good indication of this is when a hot bean is exposed to the air it splits open. Remove herbs and garlic clove and add salt and pepper to taste. At this point the beans can be made hours ahead of time and re-heated just before serving. - cut 2 cm thick slices of bread, brush with olive oil and either brown under a grill or on a very hot griddle pan (which will give you attractive scorch marks on the bread). - for each person place a slice of bread on a serving plate, top with warmed beans and lightly grate on botargo to taste. A very small amount of botargo is required to give depth of flavor to the beans. I tend to cook a lot of dishes that are never tasted by anybody other then myself. When researching historical recipes, often the only way to develop a sense of the people who wrote the recipes and the food they were eating is to attempt to make their food itself. While this process is quite a fun and relaxing pass time, quite often the food just isn't to modern tastes - other then my own. Very occasionally I come across a recipe that is both of intellectual interest and produces an absolutely delicious result. In this case the recipe(s) in question are "Syringed Fritters". Recipes for these types of fritters occurs at least as early as the 16th century, with the German cookbook written by Sabina Welserin 1553 desribing how to make fritters called Strauben and Spritzgebackenes out of hot water dough (similar to a modern Choux pastry) with special funnels or a pastry bag and in his "Ouverture de Cuisine" (1604), Lancelot de Casteau describes the production of similar hot water doughs which can be dropped from a spoon or pushed through a speriche or sering (Syringe). In 17th century England Robert May's "The Accomplisht Cook" has a recipe titled "To fry Paste out of a Syringe or Butter-squirt". So it seems that by the 17th century large syringe type devises were used as kitchen utensils in large, well stocked kitchen in many European countries. These were mainly used to squeeze out butter into decorative ribbons or threads (hence "butter squirt") and to pipe out marzipan for baking, but they were obviously also used for making fritters. The fritters made in this manner were almost always made from a Choux type pastry or other hot water type pastry, most likely because this dough is quite plastic in nature and therefore able to be piped/syringed into hot oil without falling apart. Most recipes for fried choux pastry from the late 17th to early 18th century consisted of small balls of pastry, rather then syringed sticks of pastry. As these small choux pastry fritters were hollow and very light in texture they were often known as "Pets" (farts) in French cooking texts In some cases they were known as "Whore's Farts" or "Nun's Farts" depending on the humour of the author. In the more straight-laced 19th century the nun's "Farts" were often turned into a "Sighs". In the 18th century "Syringed Fritters" occur in many English cookbooks. Curiously, these recipes are all very similar and are obviously copied from each other, rather then being original creations. The earliest example I have been able to find is from the anonymous "The Whole Duty of a Woman" 1737. This recipe was then published by Hannah Glasse, and later Charlotte Mason, with some re-wording. Richard Briggs re-writes the recipe with more detail. To make Syringed fritters (From "The Art of Cookery Made Plain and Easy" 1747, Hannah Glasse). TAKE about a pint of water, and a bit of butter the bigness of an egg, with some lemon-peel, green if you can get it, rasped preserved lemon-peel, and crisped orange-flowers ; put all together in a stew pan over the fire, and when boiling throw in some fine flour; keep it stirring, put in by degrees more flour till your batter be thick enough, take it off the fire, then take an ounce of sweet almonds, four bitter ones, pound them in a mortar, stir in two Naples biscuits crumbled, two eggs beat; stir all together, and more eggs till your batter be thin enough to be syringed. Fill your syringe, your butter being hot, syringe your fritters in it, to make it of a true lovers-knot, and being well coloured, serve them up for a side-dish. Syringed Fritters (From "The Ladies Assistant" 1787 by Charlotte Mason). TO a pint of water, add a piece of butter the size of a large egg, some preferved lemon-peel, crisped orange-flowers, and some green lemon-peel grated ; put them in a stew-pan over the fire, and when they boil throw in fome fine flour ; keep it stirring, and by degrees put in as much flour as will make the batter thick enough ; take it off the fire, stir in two Naples biscuits crumbled, an ounce of sweet almonds, three or four bitter ones, pound them in a mortar, mix it with eggs well beat, till the batter is thin enough to be syringed; let the butter be boiling hot in the frying-pan, and syringe the fritters into it; fry them of a good colour. They make a pretty side dish. Syringed Fritters (From "The Art of Cookery" 1788 by Richard Briggs). them, and sprinkle powder sugar over them. Hannah Glasse re-interpreted and re-wrote the recipe from "The Whole Duty of a Woman", as butter is used to shallow fry the fritters, rather then the original method of deep frying in lard, this method is copied by Charlotte Mason. In fact some later authors copy the recipe given by Hannah Glasse word for word (for example John Farley in 1783). Richard Brigg's recipe is interesting as it seems not to have been copied from Hannah Glasse. Finally recipes for these types of syringed fritters disappear from English cookbooks at the end of the 18th century, although they occasionally turn up in cooks "Dictionaries" or other similar large recipe collections, for example in Richard Dolby's "The Cook's Dictionary and Housekeeper's Directory" (1833). Clearly the later recipes owe a great deal to the "The Whole Duty of a Woman" (especially the Glasse version), but is this an original recipe and if so, what is the source material used? In looking for the origin of these english recipes, it is important to define what is important about the recipe. Clearly they are fritters, but there are thousands of different types of fritters, independently derived in multiple cultures. A more precise definition of these fritters is that they are made from a hot water pastry (flour is added to a hot liquid), specifically a form of Choux pastry and that they are formed by squirting out of a syringe. A syringe is a very specific tool, so it is relatively easy to look for references to it in cooking texts. A good place to look is in the books index, glossary of culinary terms or in the Batterie de Cuisine and ideed in Menon's "La Cuisiniere bourgeoise" there is the following description of a syringe as used as a culinary item. "SERINGUE. Est un ustensile d'office dans lequel on seringue la pâte des massepains pour la friser, ou lui donner une autre figure : on s'en sert aussi à la cuisine pour les beignets de pâte." Mettrez dans une casserole gros comme un oeuf de beurre, deux citron verds rapes, de la eau de fleurs d’orange une pleine cuillere a café...."
Mettez dans une casserole une chopine d'eau, de la farine, & gros comme un oeuf de beurre. Formez en une pate royale bien ferme. Mettez le dans le mortier avec du citron rapé, un peu de fleur d'orange, amandes pilées, ou quelques biscuits d'amandes ameres. Mettez-v des oeufs a mesure que vous pilez, mettez-en jusqu'a ce qu'elle soit au soit de pouvoir la mettre dans la seringue. Alors vous l'emplirez & pousserez vos beignets dans la friture. Il saut qu'au bout de la seringue il y ait une petite plaque de fer qui bouche les trous, qu'ils soient dessines en las d'amour ou autre chissre. Vous les faites frire de cote & d'autre & les servez avec du sucre en poudre"
As you can see these recipes starts off almost exactly as the English recipes for "Syringe Fritters", an "egg of butter", "green citron rind" and "orange flower" (not "crisped orange flowers"). Unfortunately Menon's work, although hugely influencial in French and English cookery wasn't published until 1746 and Marin's in 1750, nearly a decade after the "The Whole Duty of a Woman" recipe. Clearly we are looking for a recipe which is the source of both the early english and french recipes. Although the English published a great deal more cookbooks then the French in the 17th century, late in this century several hugely influencial French works were produced. One of the most influencial French cookbook authors of this period was François Massialot. In 1702 "The Court and Country Cook" was published in English, this is a translation of the third edition of "Le Cuisinier royal et bourgeois" and the second edition of "Nouvelle Instruction pour les Confitures. les Liqueurs, et les Fruits". Unfortunately, I don't have access to the english translation, but in "Le Cuisinier royal et bourgeois", the following recipe appears. Prenez une casserole, & y mettez de l’eau, avec gros comme une noix de beurre, & un peu de sel, avec de l’ecorce de citron vert & confit, hache bien menu. Faites bouillir cela sur ub sournean; y ayant mis deux bonnes poignees de farine, tournez-le a force de bras jusqu’a ce que cela se detrache de la casserole. Alors vous le tirerez en arriere; & y metteant deau jaunes d’oeufs vous les melerez bien ensemble, continuant d’y mettre d’eux oeufs a deux oeufs jusqu’a dix ou douze, que votre pate soit delicate. Il saut ensuite fariner sur son tour, tremper la maon dans la farine, & tirer votre pate par morceaux sur le tour. Quand elle aura reose, il saut la rouler & couper par petits morceaux, empechant qu’ils ne s’attachent l’un a l’autre: & quand on sera prêt a server, vous les frirez dans du bon saindoux; & les ayant tirez , vous jetterez du sucre dessus & de l’eau de fleur dórange, % vous servirez promtement por Hor-d’oeuvres. ON en peut aussi garner des Tourtes de crème. Les Beignets au Bouillon se sont de meme: au lieu d’eau, vous servez de bouillion." So here I think is the explanation for the confusing "some green Lemon-Peel rasp'd, preserved Lemon Peel" that we see in "The Whole Duty of a Woman", this is simply a poor translation of "de l’ecorce de citron vert & confit". Basically the French recipe is talking about the preserved/candied rind of citron (Citrus medica), not a green lemon (Citrus limon). It is a very odd confusion to have made in light of the fact that preserved citron peel was a very common ingredient in English and French cookery of this period. Another thing to note is that there is no mention of a syringe in this french recipe. The recipe is a close, but not an exact match. An explanation of this is that this type of pasty can be used in a number of different ways and that in many recipes the option to syringe the batter is is left up to the user. Another angle is that there is another recipe that is a more exact match for the "The Whole Duty of a Woman" recipe and indeed, this is what turns out to be the case. Quite by chance when researching these recipes I read in the excellent introductory material written by Jennifer Stead and Priscilla Bain to the Prospect Books facsimile edition of Hannah Glasse's "The Art of Cookery Made Plain and Easy", that while Glasse sourced a great deal of material from "The Whole Duty of a Woman", the author(s) of this work copied their recipes wordfor word from several other earlier books. The most copied source for these books was Vincent La Chapelle's "The Modern Cook". While working in London, La Chapelle published his text first in three English volumes in 1733 and then in four French volumes in 1735 as "Le Cuisiner Moderne", it was from the english text that the "Whole Duty of a Woman" recipe is a direct copy. The French text for this recipe is also very interesting. Mettez dans une casserole environ une chopine d'eau, gros comme la moitié d'un œuf de bon beurre, de l'écorces de citron verds râpé, de l'écorces de citron confit, de la fleurs-d'orange pralinée;mettez-là dessus un fourneau,& quand elle bouillira, mettez-y, de,la farine,en remuant sanscesse avec une cuillere de bois , en continuant d'y mettre de la farine, jusqu'à ce que vôtre pâte devienne ferme, & qu'elle quitte la casserole, ensuite,mettez-la dans un mortier, avec un peu d'amandes pilées,ou de biscuit d'amande amère ; & vous y mettrez deuy œufs à la fois, blancs & jaunes, & bien pillés; vous continuerez à y mettre des œufs, jufqu'ài ce que vous voyez que vôtre pâte ne foit pas trop claire, & que vous puissiez la manier, pour la mettre, dans la Seringue: observez cependant qu'elle soit fermer car si elle étoit trop délicate, vos Bignets ne pourroient pas se soûtenir ; remplissez-en vôtre Seringue, & mettez du sain-doux dans une casserole sur le feu, & vôtre friture étant chaude, poussez-y vôtre Bignêt, qu'il sorte fort fin, & lassé comme un las d'amour, sans confusion: étant frit d'un côté, vous le tournerez de l'autre côté: étant frit d'une belle couleur, tirez-le, & le poudrez de fucre, & le servez chaudement pour Entremêts... "
It can be seen by comparing this recipe with the earlier beignets recipe from Massialot, that La Chapelle has not so much as copied Massialot as reinterpreted and expanded his recipes. In fact this process of reinterpretation and expansion of Massialot's work characterises many of La Chapelle's recipes. In Massialot's recipe for Beignets a l’eau por entremets, "l’ecorce de citron vert; confit, hache bien menu" which in La Chapelle's Entremis des Bignets Seringuez becomes "l'écorces de citron verds râpé, de l'écorces de citron confit". In other words Massialot's "candied green citron rind, chopped small" becomes La Chapelles "The rasped rind of a green lemon and candied lemon peel" and eventually Hannah Glasse's "some lemon-peel, green if you can get it, rasped preserved lemon-peel"
So we have a French recipe which though a process of poor translation and reinterpretation has been transformed into a new English recipe. I previously mentioned that I often don't serve my re-created historic recipes to other people, but in this case I am happy to say that these recipes produce delicious results. Which is very odd considering the manner in which these recipes were derived. This is my "reinterpretation and expansion of the recipe. 1 tspn orange flower water, zest of one lemon. Place water and butter in a saucepan, bring to boil and when butter is melted, add flour. Stir until a smooth dough is produced. Off the heat add lemon zest and orange flour water, almond meal and sponge fingers. Incorporate eggs one at a time. Place in piping bag (using a 1 - 1.5 cm star nozzle). Heat oil in deep frying pan until 160.C. Pipe in fritters, do not over crowd pan. Cook until fritters are golden brown and bubbling as subsided (about 5-10 minutes). Place fritters on absorbant paper, sprinkle with sugar. These produce a fritter which while superficially resembling a Spanish or Mexican "Churro" are much lighter in texture. This is due to the use of a egg enriched Choux pastry type dough for the English recipe, compared to the plainer hot water dough used for Churros. Does the resemblance to Churros go beyond the superficial? As I have previously mentioned these type of piped hot water dough fritters where known from many European countries from the 16th century onwards, but it seems that only in Spain and former colonies was the dish retained. In terms of the history of Churros, there are two popular theories. 1). "Churros" are named after a Spanish breed of sheep with the same name, or specifically the horns of these sheep. 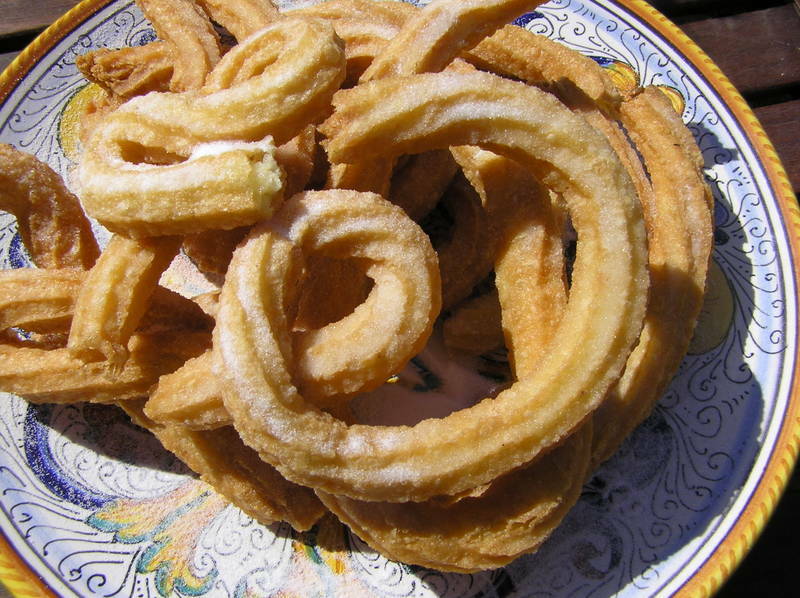 Spanish shepherds made Churros as a type of primative "bread". 2). They are derived from "Moorish" cuisine. There is no doubt that many Spanish and world dishes owe their origin to the Moors of the Iberian peninsula. However in many modern theories of the origin of modern Spanish dishes, all too often it is attributed to "The Moors" with out any further need for proof. This isn't good enough. I have looked though what Medieval Arabic recipes sources I have access to and while I can find recipes for piped fritters, I have yet to find a recipe for piped hot water dough. I would not completely discount the possibility of Moorish origins, but without proof I counldn't say any more. "No diga nadie d nadie bunolero".- Let no man call another a fritter-maker. Fritter making was a lowly occupation it seems. Another possability is that "Churro" is a regional or class specific name for a widely distributed product. From one dialect dictionary (1908) of the Aragona region we have the following definition. A Churro or Chorro is either a "spurt of water" or a specfic name for a type of pastry (unfortunately no more information is given about the form of this pastry). The modern name for the "Churro" fritter being derived from the Spanish for "spurt/squirt" ("Chorro") fits very well with the nature of these fritters and I believe that at this point this is the best explanation for the origin of the name. 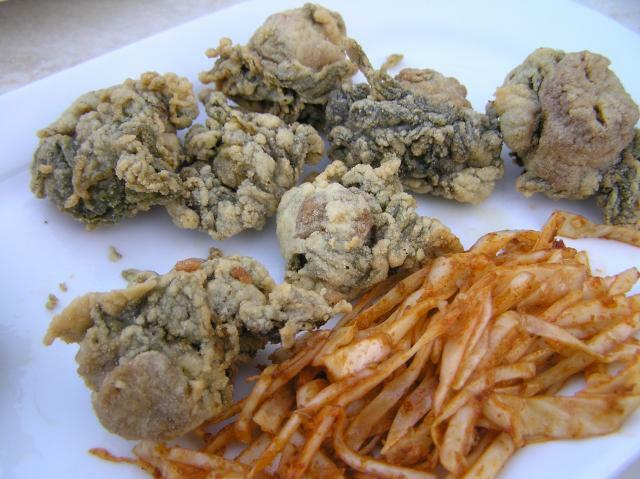 There are older forms of these fritters from the Iberian peninsula, in at least two 18th century cookbooks from this region, recipes for "Syringed Fritters" occur. 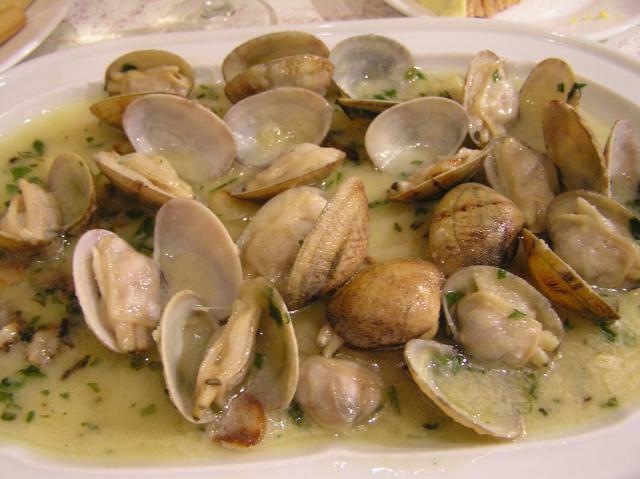 A recipe for "Fruta de siringa/ciringa" (Syringed Fritters) appears in the 1758 edition of the Portuguese cookbook "Arte de Cozinha" by Domingos Rodrigues and the 1763 edition of the Spanish "Arte de Cocina" (first published in 1611 by Francisco Martinez Montiño, head chef to King Felipe IV of Spain) contains a recipe for "Otros bunuelos de viento" this recipe is describes the production of a choux type pastry fritters doughnuts and finishes with the phrase "Esta masa sirve ...., y para fruta de geringa" ("This dough is used for syringed fritters"). This latter book was hugely popular in Spain and it's colonies, being printed well into the 19th century. In later texts "Fruta de geringa" becomes "buñuelos de jeringa". In this form it appears in both Spanish and Mexican cookbooks of the 19th century. 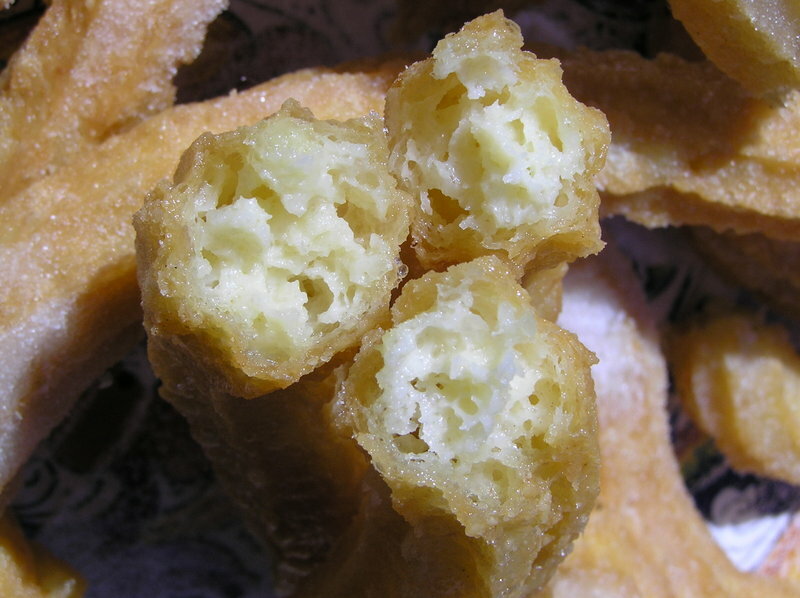 Is it possible that the modern "Churro" is simply a re-naming of the old Spanish "buñuelos de jeringa"? What is the relationship between the Spanish "Fruta de geringa" and the French "Bignets Seringuez", are the 18th century Spanish and Portuguese recipes derived from the earlier French works, are the Spanish/Mexican Churros actually French in origin? Without access to earlier editions of the Spanish text I can't answer these questions, but hopefully somebody may be able to. What ever their origin, syringed fritters are delicious. ..The words l'écorce de citron verd & confit can be grammatically misleading for a non-French speaker. I think there may be an ellipsis here, which was quite common in writing at that time. It could actually mean "de l'écorce de citron verd et de l'écorce de citron confit", meaning that both grated fresh (green) lemon peel and preserved lemon peel were used. Only a guess, for that is not clear. However if we are dealing with only one ingredient here, it is most probably lime - or unripe lemon peel, which I doubt - and not citron. The mystery remains as whether it could mean candied green (i.e. 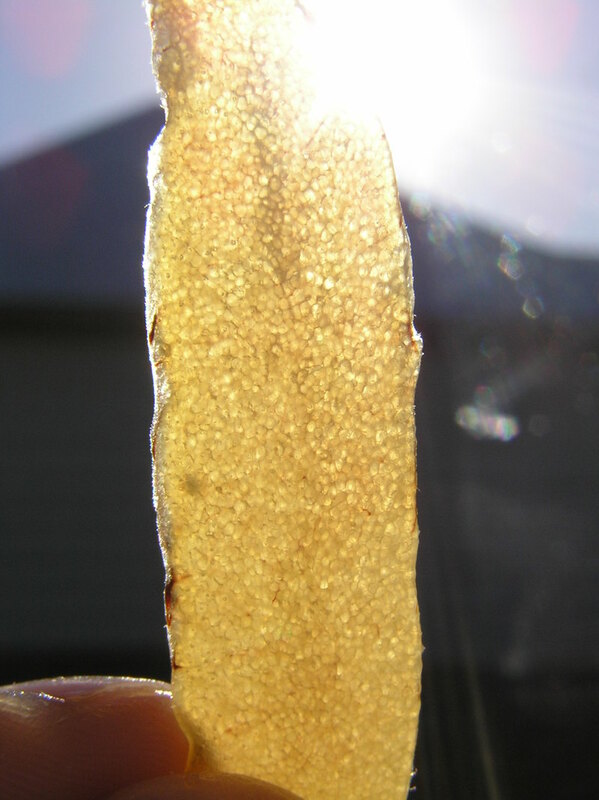 unripe) lemon peel or candied lime peel. Now, since I have never heard of the use of preserving unripe lemon peel in sugar, and I am pretty sure that preserved lime peel was known, I do tend to think that the "green lemon" in question could perhaps be lime." Thank you very much Alyx and Sophie and helping to identify the citrus fruit in question. Not something that I could have done on my own. For the last few years we have been spending some of our free time in south-western Andalucía, specifically in the sherry producing regions around Jerez and Sanlúcar de Barrameda in the province of Cadiz. One of the distinctive tapa from the region are Tortillas de camarones, these are crispy shrimp fritters made from masses of tiny shrimp help together in a fine crispy matrix of chickpea and wheat flour, flavoured with parsley and a tiny bit of onion. 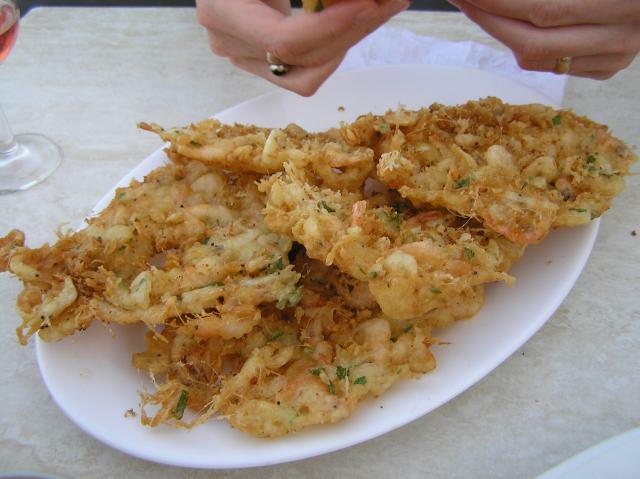 The main flavour of the fritters actually comes from the shrimp and especially their shells. These shrimp are tiny, only 2-3 cm long. I have been told that camarón is a local name for the adult stage of Palaemon longirostris and hopefully this identification is correct. The shrimp are sold live outside the main market in Sanlucar by half a dozen of so competing women shouting out "Camarón, camarón, camarón" to passing potential customers. I never actually saw the shrimp inside the market itself, which otherwise is full of fish and crustaceans. As the shrimp are sold for tiny sums of money by these women, it must represent a great deal of time and effort on their behalf for a very small return. I have also seen similar shrimp sold at the Rialto market in Venice, in both cases the shrimp are placed in simple cones of newspaper (or less romatically, in plastic bags) and you can tell who has bought them by the rustling sound the shrimp make in the paper cones as people walk by in the market. I like these tortillas very much and have wanted to make them at home. Unfortunately the main ingredient is very specific and these live tiny shrimp being difficult to some by. However, I have experimented a little and have come up with something that while not authentic, is close flavour and texture to the original. 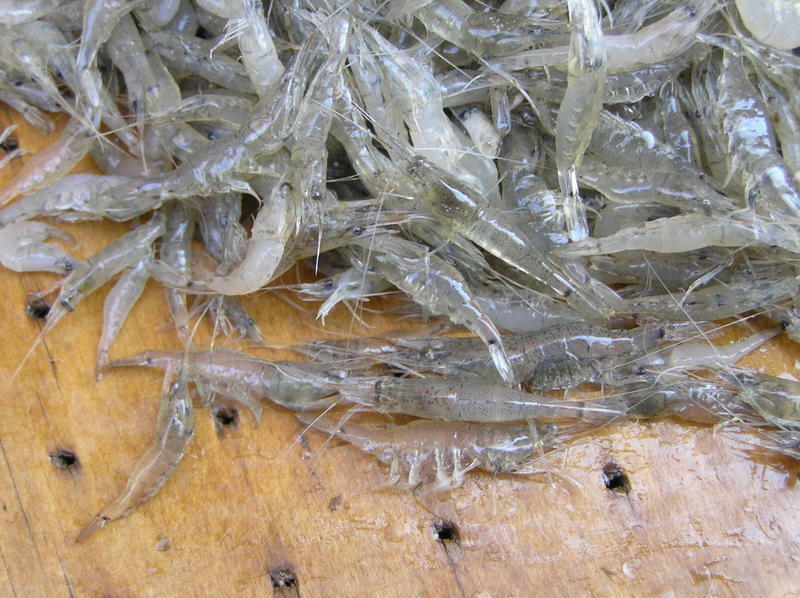 400 gm of shelled shrimp/prawns meat diced into 1 cm cubes; or 400 gm of whitebait. 100 gm plain wheat flour. 50 gm of dried shrimp (available in SE-Asian grocers,) finely ground. 5 spring onions/scallions, finely sliced. 4 Tablespoons finely chopped parsley. Mix flours together and add enough water to produce a batter as thick as single cream and 1/4 teaspoon of salt and a pepper. Rest for four hours. The batter will thicken in this period. Add the other ingredients and mix well. Add oil to depth of 2 cm to frying pan, heat to frying temperature and fry a teaspoon of the batter. Test for salt and pepper balance. Adjust as required. Fry the rest of the tortillas to a golden brown (remember that the tortillas should be 90% shrimp or whitebait, just held together by the batter). Drain on absorbent paper. Serve with a cool glass of manzanilla. "Tapas" has recently become a familiar style of serving food in many countries. In many cases this doesn't actually have much resemblance to style of food found in Spain being more of a re-branding of familiar foods by placing them into small terracotta dishes. People seem to love the idea of small portions of food and often the adoption of an unfamiliar cuisine is heavily biased towards this style of meal. Perhaps this is why that while most of us are familiar with tapas, anti-pasti and mezze, if not the wider cuisines that they derive from, that to date why I have never seen mention of “ración” on a menu outside of Spain. Tapas (singular “tapa”) were originally simply free bites of food given with drinks, the root of the word said to be derived from “'tapar”, which “means to cover”, the implication being that these small bites of food, such as a slice of bread or ham, were used to cover the mouth of the drinking vessel. Which is all very well, but actually when eating “tapas” with friends, more often then not you will not actually be eating a “tapa”, but sharing a plate of food known as a “ración”, related to the English term “ration” in the sense that it is a portion of food. So if you happen to find yourself in a tapas bar in Spain, don’t be surprised if there is some confusion if you order a tapa of an item that listed on the chalkboard – it may actually only available as a ración. Whatever the terminology eating tapas at a bar, while drinking a glass of manzanilla is a fantastic experience. 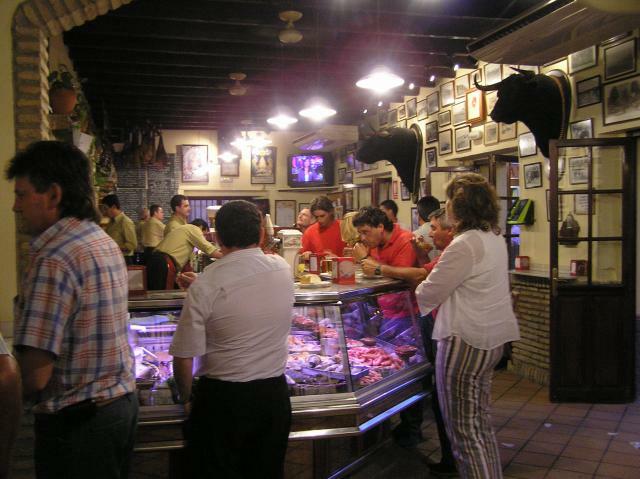 Venues that sell tapas vary hugely; from tiny bars with containing only dozens of shouting customers, hanging hams and board covered barrels as the bar top, to glittering restaurants in elegant 18th century buildings. In the former case when you make an order, your tab will be written on the bar top in chalk, the length of the chalk scrawls a graphic reminder of how much you have eaten at the end of the evening. The types of foods available varies a great deal from venue to venue and also between regions. Here are some of the more interesting intems that I have eaten, along with the raw ingredient in some cases. Casa Balbino. An lovely atmospheric tapas bar in Sanlucar. This bar is so popular that although there is a huge amount of outdoor seating and there is still times when you have to prowl around the outskirts of the seating, waiting for a table to become free. The food is very good and the staff second to none. I should stress this last point, as really they were very good to me, considering my profound lack of Spanish and how busy they were. Here are some more interesting items on the menu. Ortiguillas in there raw state, as sold in the market. 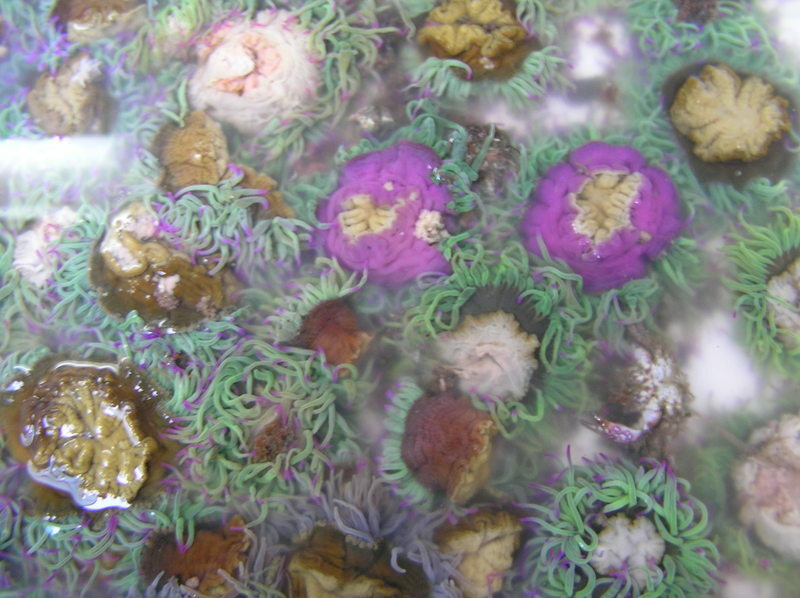 These are actually Snake-locks anenome (most likely Anemonia sulcata). These were simply floured and fried and served with a side of cabbage salad (cabbage, paprika, cumin, lemon juice and olive oil). They have a similar brine-iodine flavour as fried oysters, but a much softer, almost creamy texture. Well worth trying. Tiny shrimp (most likely Palaemon longirostris) used for marking Tortillas de Camarones. See this link for a video of them hopping about like fleas at the market. These tortilla demonstrate why Andalucía is famous in Spain for it's fried dishes. They huge crispy wafers of shrimp which really are quite extraordinary, a beautiful demonstration of the fryer's art. 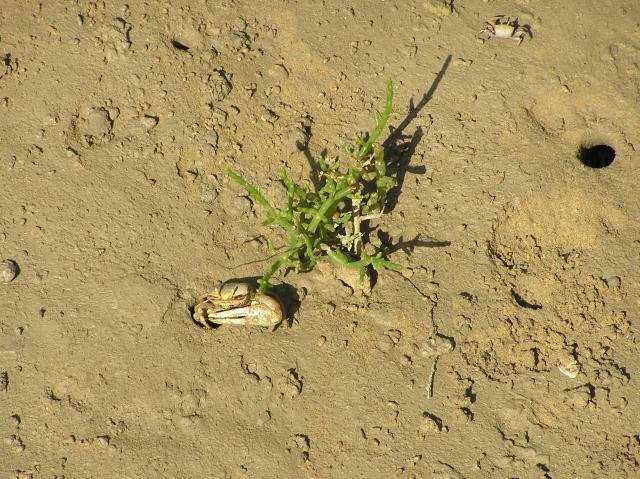 A fiddler crab (Uca tangeri) next to a sprig of marsh samphire (Salicornia europaea) on mudflat on the Guadalquivir river. Apart from the mud, all quite edible. On the Sanular side of the river, the large claws of the male crabs are harvested. In theory, once returned the crab lives to produce another claw. I have seen a similar practive of claw harvesting on large brown crabs on the west coast of Ireland. 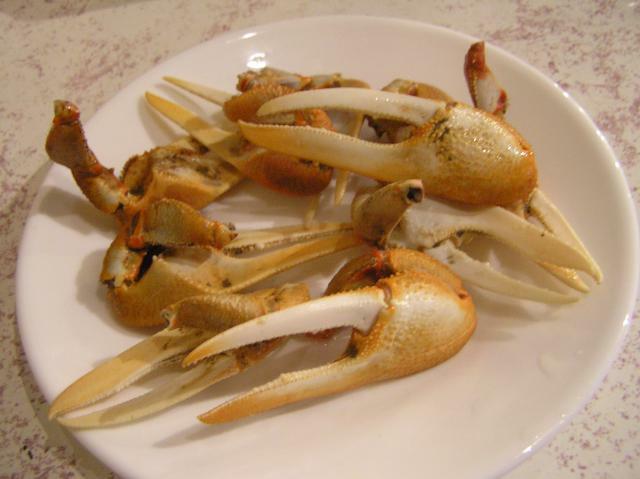 Boca (the local name of the fiddler crab) as served as a tapa. 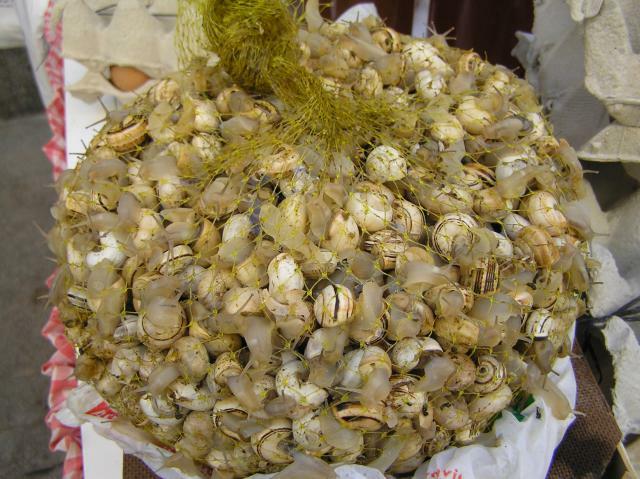 A bag of snails, Theba pisana to be exact. These tiny snails under go aestivation during the summer months, where they climb up any upright structure and go dormant in great pearly clusters. 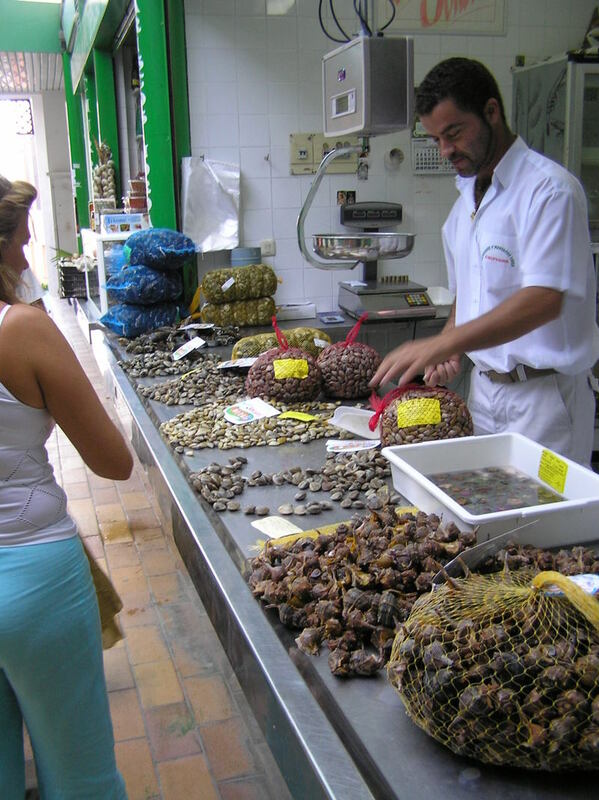 In the market these snails (as well as several other species) were sold with small bags of specific spices to cook them with. The spices used were: Anise, coriander, black pepper and chilli. The cooked caracoles, served in there cooking liquor. 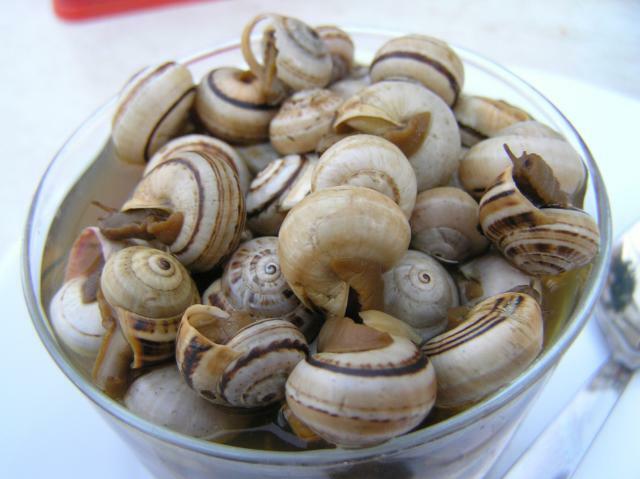 Many places don't even mention the word caracoles, just a few spirals of chalk on the blackboard seems to be enough to send a great proportion of the local population into a snail eating frenzy. They are delicious and it is a nice way to kill some time chatting, picking out the flesh with a toothpick and sucking any stubborn bits out of the shell. The broth was delicious, almost rosemary flavoured, I could drink it alone.